Brilliant, high-canopy bird of summer. Common in East in summer and migration; winters in South and Central America. Medium, stocky, large-headed songbird with thick, rounded multipurpose bill; males are brilliant red with black wings; females yellow with brown wings. 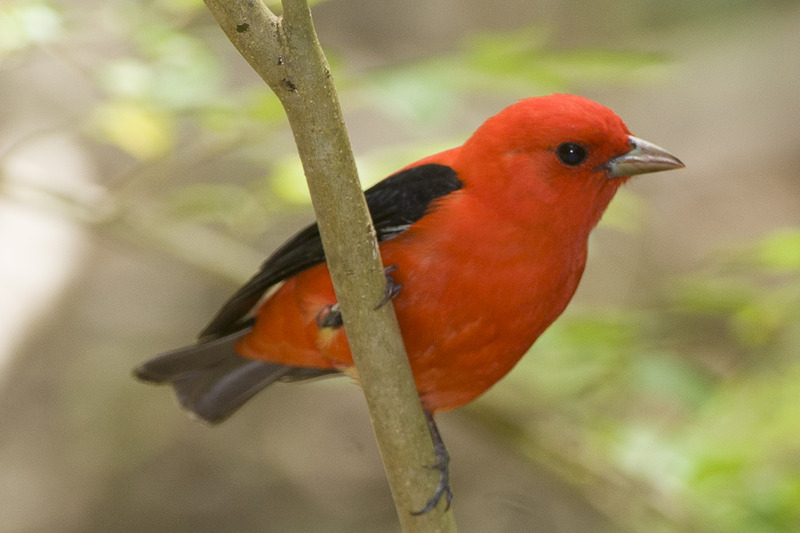 Often hidden in upper canopy of undisturbed deciduous and mixed forest, but detected by bright red color and burry, run-on song; females sing softer version of song. Primarily insectivorous in summer; eats fruit in migration and winter; attracted to native berry plants in yards. Typically nests in high tree branch, away from trunk. Lifespan up to 12 years. Population ~ 2.2 million and stable.